Paranormality launches in the USA….and the Friday Puzzle! Paranormality launches in the USA today……under rather unusual circumstances! Paranormality takes a scientific look at the paranormal, exploring psychic readings, out of body experiences, mind control, ghosts and dream precognition. It is very interactive and allows readers to develop various ‘superhero’ powers. Richard Dawkins was kind enough to provide an endorsement, writing “Wiseman shows us a higher joy as he skewers the paranormal charlatans, blows away the psychic fog and lets in the clear light of reason”. The book has done well in the UK and has been bought by publishers in lots of other countries. However, the major American publishers were reluctant to support a skeptical book, with some suggesting that I re-write it to suggest that ghosts were real and psychic powers actually existed! We didn’t get any serious offers and so it looked like the American public (around 75% of whom believe in the paranormal) wouldn’t get the opportunity to read about skepticism. Then I had an idea. I am going to self-publish an unashamedly skeptical book in America and see what happens. Today the book launches on Kindle and my UK publisher will ship physical editions into America (and it will appear as an iBook very soon). It all feels like a scary but exciting experiment. If you are in the USA you can buy the Kindle edition here and the physical edition here. There’s more information about the book here. This is the book that lots of people don’t want Americans to read and I hope that you will support the project. So, I hear you cry, what of the Friday puzzle? Well, I have made this little video to promote the launch. The question is….. can you figure out how the deck is levitating? UPDATE: Rebecca Watson has just posted a review of Paranormality on Skepchick here. As ever, please do NOT post your answers but feel free to say if you think you have solved it and how long it took. Solution on Monday. I have an idea about how it’s done, but I’m not that confident it’s the right answer. Got it, took me about 5 minutes. I know but only because you’ve shown us videos with a similar trick. You’ve trained us too well, it seems. Mind you, I probably wouldn’t have any idea how “it” is done! Saw it 20 seconds into my first watch of the video. A very nice illusion, but it looked a bit too fishy to be convincing. At least I don’t have to sit down with pen and paper this week like I do most weeks. Guessed the basic illusion upon seeing the still frame before I played the video–confirmed the details when I played it. But I’ve seen similar illusions before, and it took me years to figure them out. I knew as soon as I saw the preload image of the video but you’ve posted videos of similar tricks before. I’m pretty sure I know *what* I’m looking at, but the best way I can come up with for keeping it there is a little clumsy – would like to see a more elegant solution…. Can’t watch the video because it’s restricted here where I work. Aha! Got it. Obvious once I had my eye in. Ok, I know how the other illusion is done, but I can only take guesses about the actual float. Figured it out immediately after the “What you are about to see…” slide. I wouldn’t have used a deck with a glossy finish. there are hundreds of illusion videos like this, i will say its the first time ive seen it with a deck of cards, but this is as old as the hills. Probably a classic example of Augmented Reality! It took me 38 seconds to clearly see the indiction how it is done, even though in expected this trick nown from other similar illusions.. I knew the answer to this one even before watching the video. And good on ya! More people need to read your book. Even though I think that the hand experiment was just a trick to get people to stroke hands for half an hour. Might have been better shot from a greater distance with zoom. I figured out immediately how it was done, then I had to actually ‘see’ the trick. And I agree the glossy deck material helped !! The slightly strange perspective on display between 0:15 and 0:23 should be enough of a clue to anyone who’s thinking “Is it what I think it is?” Certainly was for me! In regards to the book: curse the luck, I have a Barnes and Nobles Nook! Any way to get it ported to them as well as Amazon? I actually guessed the answer before actually seeing the ‘levitating shot’. I suppose I’ve seen this trick too many times. Solved straight away, but only because I’m familiar with all the other illusions that work the same way. that’s a clear case of Garbage In, Garbage Out. By the way it’s behaving I have a hunch what’s going on. I’ve made similar objects myself. Saw half the trick instantly. Took a little longer to see how it levitated as the underneath shot confused me. Then with a secod look, the same shot answered the question for me. So American publishers will sell books that are skeptical of religion, politics, economics, science, history, and even punctuation, but not the paranormal? Very odd indeed. It must be too popular for university presses and not popular enough for commercial presses. Also really glad I bought the book MONTHS ago through Amazon.co.uk. Think I’ve got it after a couple of watches, will find out on Monday! I’m guessing it’s because the editions have different publishers, but the Kindle and paperback Amazon pages don’t link to each other. The paperback even has the “click here to tell the publisher you want to read this book on Kindle” link. Had it as soon as I saw it. I have seen and made these before. I got it instantaneously because of your previous illusions that you have made. As so many others did, I got it immediately because this isn’t the first illusion of this type you have shown us. It still looks uncanny every time I see it, though. 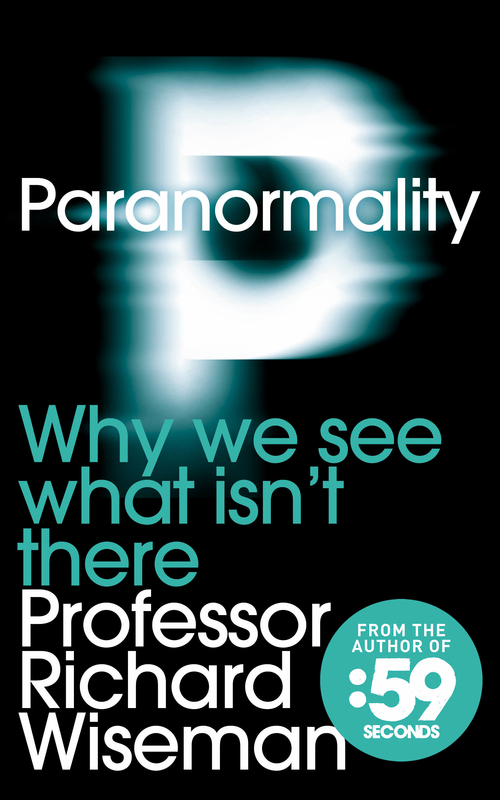 Being an American, I feel shame that our publishers felt we would not buy a book on the paranormal unless its position is one of stupi- er, I mean, uncritical credibility. I’ll cheerfully support this book. The odd perspective part is easy, and I can think of a couple of ways that the float might be maintained. This is the first one of yours I’ve encountered, so I’ll check back on Monday for the full details. I love that you are self publishing! I think this is the direction everyone should go in. And I would buy your e-book in a heartbeat. Except that I don’t like to be locked in, or perpetuate the too-close-to-monopoly-for-comfort on devices that the biggest companies have, so I don’t have a Kindle. Here’s hoping you will sell it in the Open epub format too some time soon! Just saw the link on boingboing, bounced on over here, and grabbed myself a good old “American” Kindle edition. Can’t wait to start in! Will buy the iBook instantly upon its release – and I am spreading the word about the various self-publication release modes. I know exactly how this was done. Also, I would like to know how I can donate directly to you because I’m going to pirate the book so I can get it on my nook — I don’t have a kindle. I think it’s a bit odd that you couldn’t find a publisher, given that Martin Gardner, James Randi, Ray Hyman and many many others have been publishing s[kc]eptical books in the US for the better part of a century. Did you really look? Ok, solved the nook problem: pirated it, then bought it at amazon and downloaded it to the kindle app on my phone. here is the give away to these illusions. third, the movement of the object is opposite that of the camera’s. ie. if the camera is panning left, the deck rotates right about the fixed point. The rewrite suggestions are ridiculous! I’m buying an extra copy as a gift right now. I don’t feel like buying a second e-reader and I received a Nook Color as a recent gift. Will you be selling the book for Nook (or as a Google eBook that one can read on the Nook)? Got it in less than 11 hours. 1-2 sec 😉 this is just a variation of an oldie, isn’t it? Solved it. 10 Second for a theory. I felt pretty confident about it by the end of the video. Hey! We’re magicians–of course we can figure out how you levitated the box. So, ok, how’d u do it? I would like to add my voice to the crowd of people who would like to see non-Kindle editions of the e-books. I understand that your publishers might be uncomfortable with selling DRM-free versions of their ebooks, perhaps over concerns that it might invite liberal piracy. However, I would encourage you to ask them to consider this: The current policy has the effect of taking people who were initially excited and eager to spend money, and encourages them to instead become increasingly comfortable with the concept of piracy. Being somebody whose income comes from the sale of media, I’m not exactly a big fan of piracy. However, I’ve just been introduced to a situation where if we discard (for the sake of argument) the choices to waste some three-digit sum of money on a redundant piece of electronics, or to ensure that nobody gets what they want by not reading the book, two choices remain: I can deny you, your publisher, and your bookseller about £6 in deserved revenue by pirating the book, or I can myself spend more than the price of the book in intercontinental shipping charges. I think that even someone who is unusually opposed to media piracy is likely to recognize some moral ambiguity in such a situation. Yet this is the kind of situation in which the approximately 1/3 of your American e-reader owning fans whose devices are not supported by Amazon have found themselves. I would love to buy it, but I have a Nook. Are you going to sell it through any other e-book platforms? You know what would be awesome? A spanish version for Mexico. We need WAY MORE skeptical reading material over here. I’d like to add my support to the idea of an ebook version for the American readers. I own a Nook and would definitely be willing to pay for this book. I’d far prefer that over either not reading it or pirating it, since the physical books have sold out over here. I’d particularly like to pay you for it so you can write more books like it and hopefully get them out to more Americans! We need voices of reason in this country. Remarkable post, definitely regret not heading for the USO style dinner. Keep up the fantastic perform! Next Answer to the Friday Puzzle!